Hearing both sides of an argument is essential to learning and forming opinions. So why does Stanford deny its students the opportunity to do so? A study published in Econ Journal Watch in September reveals a strong left-wing tilt among top university faculties around the country, including at Stanford. Among 289 Stanford professors examined in the fields of economics, history, communications, law, and psychology, the University has a ratio of 11 registered Democratic professors to one registered Republican professor. This proportion is only slightly better than the average ratio of 11.5 Democratic professors to one Republican professor found in the study, which examined the 40 leading universities with information available in Voter Lists Online’s Aristotledatabase. Broken down by field, the results are even more depressing. Stanford’s history department has a ratio of 33 to 0 (versus 33.5 to 1 nationally). Psychology had even less ideological diversity. at 34 to 0 (17.4 to 1 nationally). The Law School has a ratio of only 11.8 to 1 (8.6 to 1 nationally), while the economics department is the least skewed, at 3.1 to 1 (4.5 to 1 nationally). The study also found significant differences in political affiliation between younger and older professors. For professors under the age of 36, the Democrat to Republican ratio was found to be 22.7:1 nationally, the most skewed of all age groups. Similarly, assistant professors have a high Democrat to Republican ratio nationally, at 19.3 to 1, while Emeritus professors’ are less imbalanced at 8.6 to 1. According to the study’s authors, the faculty viewpoint diversity problem is likely to grow even more pronounced at most universities. As older professors retire, younger, more Democratic-leaning professors will presumably take over the leadership of their institutions. The survey results did not surprise Evan Long, a Stanford junior and a conservative. “What these numbers show me is that there’s no diversity of opinion, and probably no discourse happening in the fields where it’s really important,” he said. This survey confirms the findings of a number of recent studies. One found there to be approximately three times the number of Marxists as Republicans in the social sciences. Two in five sociologists said they were less likely to hire a person they knew to be an Evangelical Christian. Might it be time to admit that we have a problem? Top universities like Stanford pride themselves on taking racial and gender diversity seriously. These schools do not deny their own biases, but make organizational efforts to counter them. They seek to understand how their decisions might unintentionally exclude minority groups. Stanford would benefit from giving viewpoint diversity some attention and care as well. Academia was not always this way. In the 1960s, Klein and Langbert write in their paper, academic historians had a Democrat to Republican ratio of about 2.7 to 1. Now it is 33.5 to 1. Perhaps it is unsurprising then, that a recent paper for the American Historical Association’s news magazine found that areas of specialization within the field of history have been changing; among thespecializations that are growing rapidly are women’s and gender studies, cultural studies, environmental studies, and race and ethnic studies. “Things began changing in the 1990s as the Greatest Generation (which had a fair number of Republicans) retired and were replaced by the Baby Boom generation (which did not),” wrote social psychologist and NYU Professor Jonathan Haidt for Heterodox Academy, the website and brainchild of a group of scholars who advocate for a more intellectually diverse academy. 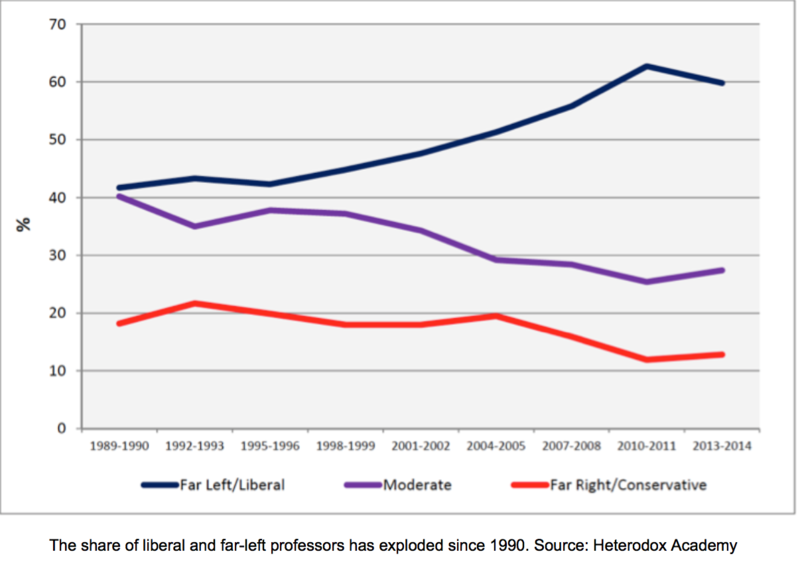 Other factors may also have contributed to the Left’s dominance in academia. Willick wrote in The American Interest that the “canon wars” of the 1980s and 1990s, which led universities to prioritize multiculturalism over the teaching of Western-civilization courses, may have also made schools unattractive to conservatives. For example, Jesse Jackson once joined 500 Stanford students chanting, “Hey hey, ho ho, Western Culture’s got to go!” as they celebrated the replacement of Stanford’s humanities core. This is the front that universities often present, unintentionally or not, to conservative students. The political disparity in the academy is apt to damage academic work. As Haidt wrote at Heterodox Academy, a lack of ideological diversity may allow “entrenched orthodoxies” to remain unquestioned. “The academic world must have viewpoint diversity if it is to function properly and produce reliable research,” he warns.